Slow Cooker Saucy Thai Butternut Squash Curry. 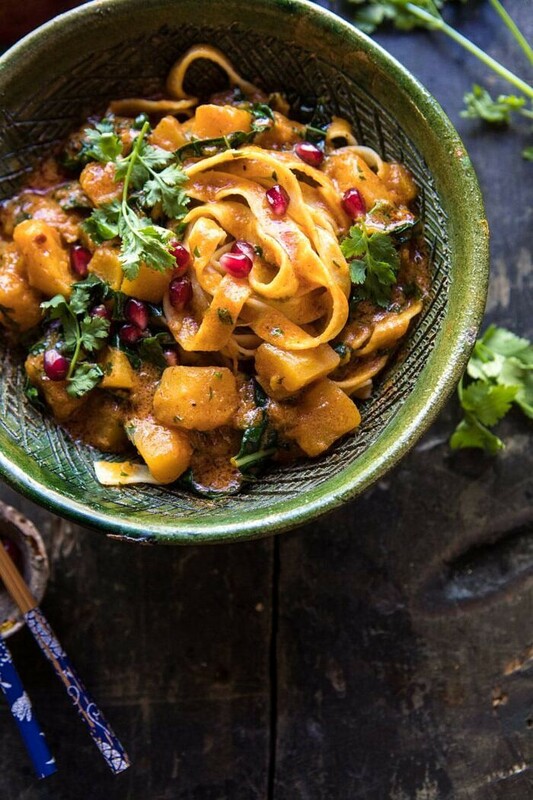 Slow Cooker Saucy Thai Butternut Squash Curry with Noodles. 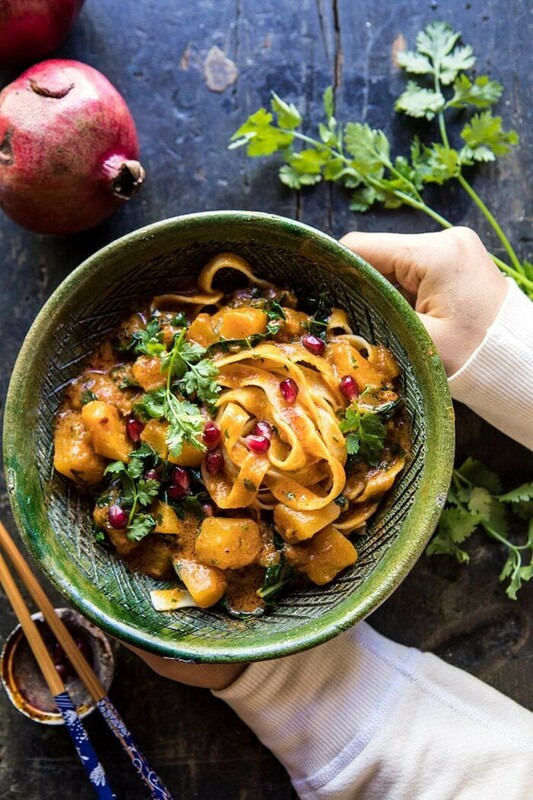 This most DELICIOUS autumn inspired curry is extra saucy, spicy, sweet, and served over egg noodles. Add all the ingredients to your slow cooker, turn it on, and forget about it. So easy, super healthy, warm and cozy. Perfect for the busy fall nights ahead. I’ve decided that all Mondays are made better, and easier, with recipes like this slow cooker curry. Things have been beyond hectic over here, and while I love it so much, and am so grateful for all the amazing opportunities and fun things we are doing with HBH, it’s definitely left me with much less time! I’m in NYC today for work, heading home late tomorrow, and as soon as I get home I will hit the ground running. Working on organizing the studio, projects I have yet to announce (but hinted about…), and upcoming content for HBH. I’m excited about it all, but again, it just means things are busy. Pretty sure you all can relate, right? Thankfully we have slow cooker recipes to help save the day. 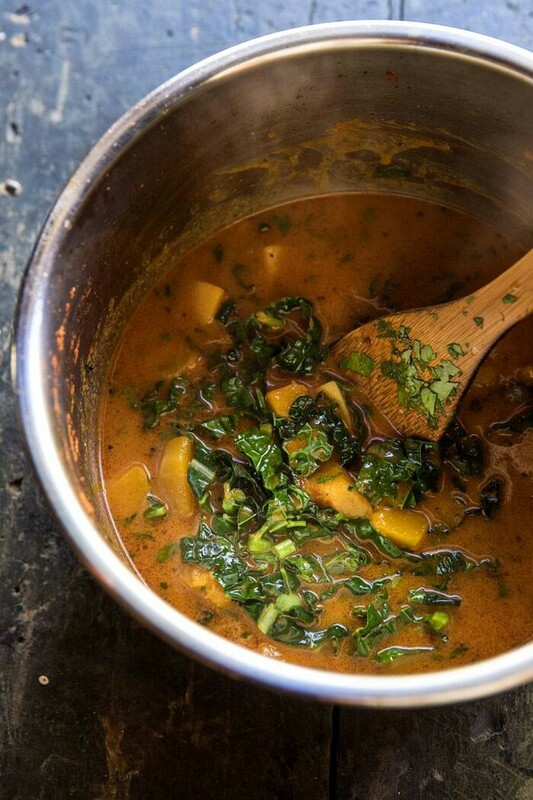 Enter this curry that’s all things fall, all things healthy, and all things delicious. This is one of those great recipes that honestly requires almost no thought to make, practically no time, and conveniently uses many pantry staple ingredients. It can also be made not only in the slow cooker, but in the instant pot as well. Promise it is not too good to be true. Come late September, butternut squash is positively my favorite vegetable to cook with. It’s sweet, savory, and so satisfying. I love pairing it with all kinds of things like, soup, pizza, pasta, Indian dishes, and even pancakes, it’s incredibly versatile. So, I’m excited to share this curry. You ready to hear how to make it? OK cool, it’s super quick. Add the cubed butternut squash, Thai red curry paste, coconut milk, and a handful of other ingredients to your slow cooker. Set the cooker, forget about it for six or hours, come home, smell the delicious smells, boil some egg noodles, plate and enjoy! Yes, it truly is as simple as that. 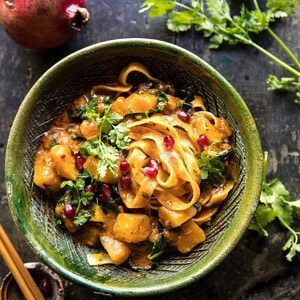 I served my curry over egg noodles with a handful of fresh pomegranate arils, but you could just as easily serve this with rice noodles or even rice. We decided that this is best with noodles, but make your own choice here, and use your favorite carb. Quinoa would be equally great! As for the pomegranate, I love the sweet burst of flavor the arils give to the dish. 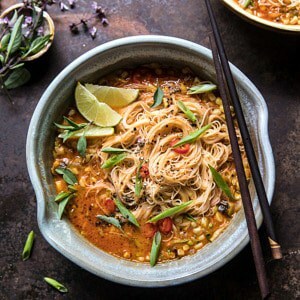 They bring a pop of bright fresh color, and the flavor pairs extremely well with the Thai flavor happening in this curry. Also? I just love pomegranates and am very happy they are coming back into season. Expect to see lots of the pretty little jewels sprinkled throughout my recipes this fall. Perfection in my eyes, and perfect for any night of the week, but especially a busy Monday night! OH, and bonus? This is (almost vegan) and totally healthy. Cool. Cool. If you make this slow cooker saucy Thai butternut squash curry, please be sure to leave a comment and/or give this recipe a rating! Above all, I love hearing from you guys and always do my best to respond to each and every comment. And of course, if you do make this recipe, don’t forget to also tag me on Instagram! Looking through the photos of recipes you all have made is my favorite! 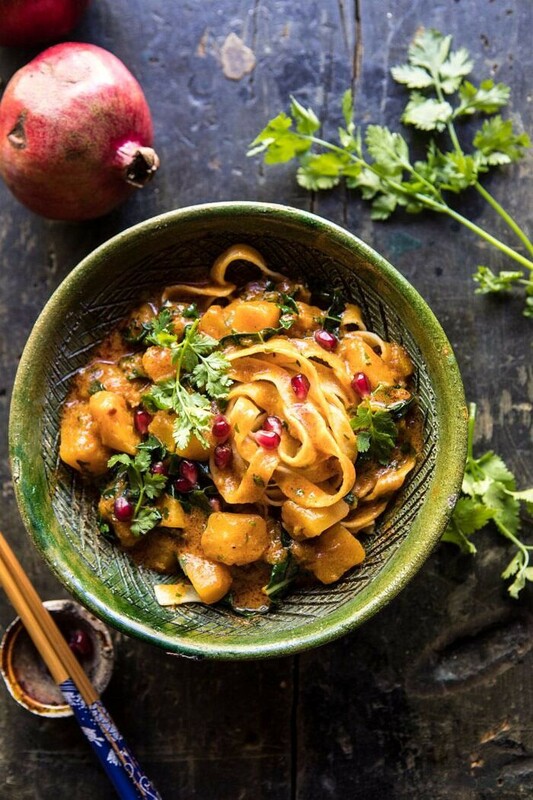 This most DELICIOUS autumn inspired curry is extra saucy, spicy, sweet, and served over egg noodles. Add all ingredients to your slow cooker, turn it on, and forget about it. So easy, super healthy, warm and cozy. Perfect for the busy fall nights ahead. 1. In the bowl of your slow cooker, combine together the curry paste, coconut milk, 1 cup broth, fish sauce, and peanut butter. Add the butternut squash, cinnamon, ginger, and lime juice. Season lightly with salt and pepper. Cover and cook on low for 4-5 hours or on high for 2-3 hours. 2. Stir the kale into the curry and cook 5 minutes until wilted. Stir in the cilantro (or basil). If the curry is too thick, add broth to thin. 3. Meanwhile, bring a large pot of salted water to a boil. Boil the noodles according to package directions. 3. To serve, divide the noodles among bowls and spoon the curry overtop. Top with pomegranate arils and cilantro. Enjoy! 1. In the bowl of your instant pot, combine together the curry paste, coconut milk, 1 cup broth, fish sauce, and peanut butter. Add the butternut squash, cinnamon, ginger, and lime juice. Season lightly with salt and pepper. Cover, select the manual setting, and cook on high pressure for 8 minutes. 2. Once done cooking, use the quick release function and release the steam. Set the instant pot to sauté. Stir in the kale and cook 5 minutes until wilted. Stir in the cilantro (or basil). If the curry is too thick, add broth to thin. Chicken Broccoli Cheddar Quinoa Casserole. Saucy Coconut Curry with Rice Noodles and Garden Vegetables. Pomegranate made me pin this one to Mediterranean…… so vibrant and good 🙂 Thank you ! 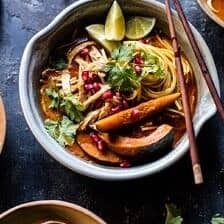 This is soooo up my alley, I love thai curries and I love butternut! How do you think added chicken would taste with this. I want more protien. This sounds delicious! Hi Terri! I am sure it would taste amazing! I hope you love this recipe! Got to try this super soon!! Beautiful colours!!! I literally can’t WAIT to hear more about what you have in store for HBH!! You’re definitely my favorite food blogger and I’ve been checking in on a daily basis to get inspired + see if you’ve announced anything special ;). Selfishly hoping it’s a workshop so I can attend and learn from ya haha! Thank you so much Christine! This is so sweet! I have a long list of recipes to make Andy most of them are yours! We think exactly alike when it comes to food! Can’t wait to try this one! Curry? CURRY!!!!!!!!!! LOL, there’s my lame Spongebob reference to the “chocolate CHOCOLATE” meme…but that being said, I adore Thai curry, especially anything with kabocha squash or potatoes! Butternut squash in a Thai curry seems delectable–I have tried it countless times with green curry and I love it every single batch! YES! I love that and I hope you try this Cassie! T, any chance this can be made without slow cooker or instant pot? We live in Europe part time and I really don’t dee like investing in one over here! Made this last night as we had some butternut squash from the garden that needed to be used (mostly because I was tired of looking at it on the counter). 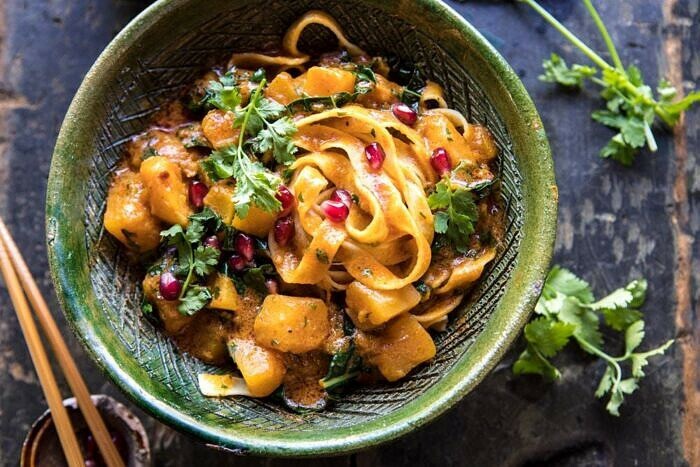 I’m not a huge fan of butternut squash (to me, it’s “meh”), but I could eat this dish by the bowlful! 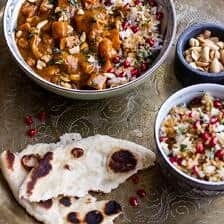 The flavors went well together, nothing overwhelmed, the pomegranate seeds added just the right sweet “pop” & the slow cooker made the butternut squash all soft & silky. It was divine. I added a can of chickpeas at the end of cooking to boost the protein but I imagine tofu or shrimp would be good too. Definitely making this again! Thanks… your recipes are AWESOME! Thank you so much Marcia! I am so glad you liked this! This looks amazingly delicious! Being 0 in the know about instant pots and pressure cookers, I would also LOVE to know how you make this without one? Just all put into a pot and simmer? Hi! First I am a huge fan of yours and literally cook your recipes daily. I made this recipe tonight in the instant pot exactly as the directions say and unfortunately it was a slight disaster. First, with the quick release, the curry itself ended up coming out of the valve, along with the steam, all over the kitchen. Once we finally got that sorted, the curry was super thin — it was more of a soup than curry. I think it might be worth reducing the liquid by almost half and leaving out the cup of water. I can see how this recipe works great in the slow cooker, just definitely needs tweaking for the instant pot. Hi Jess! I am so sorry about that! I will try this again and try to see what could have gone wrong for you. I hope you still try some other recipes of mine! I love all of your recipes – when I say this one I knew I was making it right away. I will say, i crock potted the recipe for 4 hours and it was really watery, and looked nothing like the creamy goodness you made. Was that extra cup of water needed? I’m wondering if it would’ve been the right consistency without it. Just wonding what I did wrong 😭. Thank you for continuing to share these lovely ideas! Love the idea of this and plan on making it tonight! Should the butternut squash be cooked beforehand? Thank you so much! I am so glad you liked this! 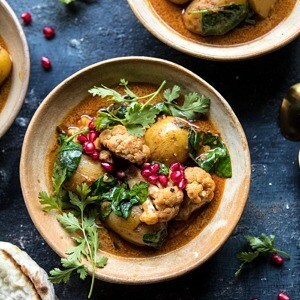 Would it be possible to make this in the instant pot? Made this for dinner this week and have been enjoying leftovers for lunch! Delicious! I made this tonight in my slow cooker and as one other reader commented, it was very watery! Also, it seems as though the coconut milk separated some, leaving tiny chunks of coconut milk solids in the curry. The flavor is great, but it’s not pretty and smooth like yours at all! We made this for dinner tonight..it was awesome. Put it over noodles…will try it with rice next time to change it up. Definitely a keeper! I am so happy to hear that! Thank you Michele! It’s officially fall here in Anchorage so this seemed like a perfect thing to make on this wet & windy day! I cooked it in my pressure cooker (I have the power pressure cooker, not the instant pot) and cooked it for the recommended 8 min…..the butternut squash was over cooked and turned into mush so I didn’t serve it over pasta but served it as a soup! My friends are devouring it upstairs as I write this and asking for more 🙂 I’ll try cooking it for half the time when I make this again! YES! I hope you love this Rebekah! Thank you! We were so disappointed in this recipe – no one in my family enjoyed and as the chef, I eat everything I make but also couldn’t eat more than a few bites so our beloved Meatless Monday became peanut butter and banana sandwich nigh. 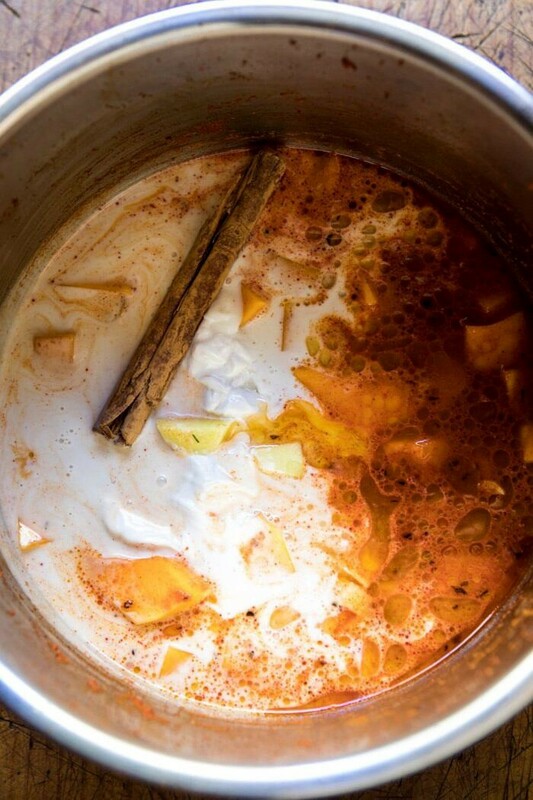 I believe there is a typo in the recipe…..the ingredients do not list water yet the instruction say to add a cup of water along with the coconut milk and broth (which I did), making this a very watery, tastesless soup, rather that a curry. The water from the butternut squash is too much here. I ended up pureeing in a blender to create something that might stick to the noodles but it was still a watery mess. I’ve made at least 30 recipes from HBH and enjoy most of them but this one needs some reworking in a big way. Hey Anne, I am so sorry this did not turn out for you. After reading your comment I went back to look at the recipe to make sure everything was correct and you are right, the water is a typo and should not be included in the recipe directions. I am so sorry and feel so bad that the curry didn’t turn out properly because of this error. I have adjusted the recipe to read correctly. In any case, thank you for bringing the typo to my attention. Again, so sorry for the trouble! Hope you continue to enjoy all the HBH recipes you try! I made this tonight. Easy. Mild flavor…. next time I’ll add more curry paste. It was very liquidy, hoped it would be more creamy saucy, and I didnt even add the 1 cup water. I can see it with double the squash if its this liquidy. Or maybe add chicken or shrimp. Thank you! I hope you love this more the next time you make it. We made this last night and loved it! The flavours were amazing – particularly liked the inclusion of the peanut butter which added a little more depth. However, the sauce was much too thin. Perhaps either the coconut milk or broth/stock could be reduced, particularly as more could always be added at the end. Thai sticky rice was a fab accompaniment! Thank you so much! I am so glad you enjoyed this! Made this tonight via stove top. Simmered for almost an hour. Turned out perfect. Even added vegan chickn cutlets. Huge hit! Thank you!! Sounds like an amazing addition. Thanks for making it Ashlee, so happy it was yummy! 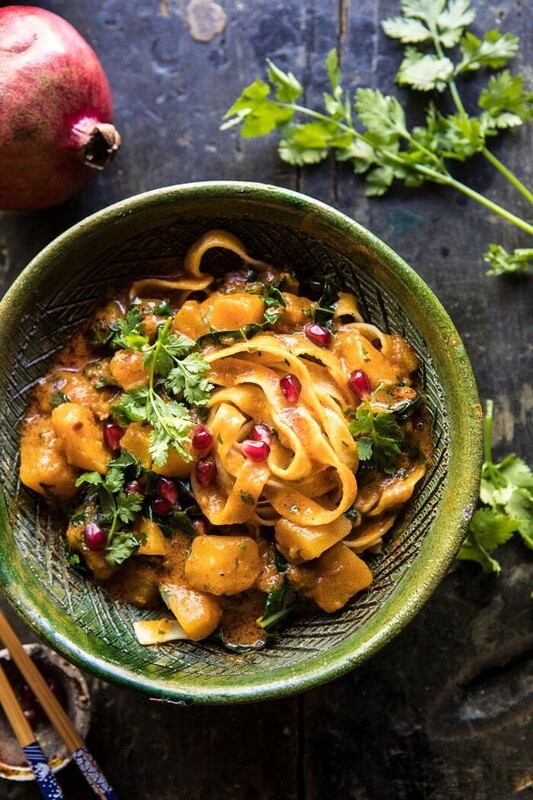 I don’t mean any disrespect, but I’m sorry to say, this recipe for Slow cooker saucy thai butternut squash curry with egg noodles was horrendously awful. It stunk and had absolutely zero flavour. I’m from the UK… we have all kinds of food in Britain. I’ve eaten West Indies curries, Moroccan tagines, Indian curries, Caribbean jerk, Hong Kong, Szechwan, Cantonese, Polish, Irish, Ethiopian, French foods. The point I’m trying to make is, there are a lot of foods and spices and flavours . My family and I didn’t really care for it. Hey Raine, so sorry you didn’t enjoy this recipe. Is there any questions you have that could maybe help you enjoy it? I really hope you can try some other recipes from my blog and enjoy them! Thank you for the feedback, it means the world for my blog! Loved the curry! Recommend using Thai Basil *yum* and while we tried it with the noodles, we found we preferred it with jasmine rice to soak up the flavors. I have three quick questions for you: if I were to want to use quinoa, could I put it in the instant pot or slow cooker right in the beginning uncooked or do I do that sperately? I’m assuming chicken could go in in the beginning, although I bet beef would be delicious too. What’s a stick of cinnamon if I were to use powdered cinnamon? Thanks so much! This looks incredible! I do not have an instant pot or slow cooker. How do I cook the ingredients? Thank you! This was my first attempt at using the instant pot, and this recipe is drool worthy! Thanks for sharing such wonderful, wholesome recipes. I am so happy to hear that! Thank you Whitney! I saw this on Instagram and had to make it as soon as possible! It was simple, completely delicious, and a great choice for my dairy-free family. I used a slow cooker and it was definitely very thin, as others commented, even with only 1c broth and no added water. The following night I reheated on the stovetop to reduce a little, added more kale, and finished cooking the egg noodles in the simmering curry. It was soooooo good! Hi Kaleigh, what kind of coconut milk are you using and what brand? I have not had this curdle one me before, so I am not sure what’s happening. Any details you can give me would be very help. So sorry for anything trouble! I made this for dinner last night and it was incredible!! I didn’t use my crockpot because I would have been away from the house for 10 hours (too long to cook this), so I made it in my cast iron pot. It was quick and easy to make and extremely delicious!! I will for sure be making this again! I am so glad you loved this! Thank you so much!! This was delicious! Even better the next day. Happy to hear that! Thank you Gina! Made this tonight and my husband said “this is restaurant quality good.” I added some crispy prosciutto on top and subbed Soy sauce for the fish sauce. Thanks for a fab recipe! Thank you so much! I am so glad you and your husband loved this recipe! Finally made this today;, with about 1 lb. diced chicken breast. Somehow I missed the instruction to add cinnamon and lime juice, so I used powdered cinnamon and juice after cooking. I also left out the kale and haven’t cut into the pomegranate yet. Served it over some leftover pasta and I think it soaked up some of the juice, which was nice. Beautiful, mild flavor, I think it got better as I ate! I am so glad you loved this and it turned out great, Charis! Thank you so much! My husband and I LOVE curries and I made this one last night for dinner. Delicious curry, thank you for sharing! We’ll be trying more of your recipes in the future, HBH! The only thing we’d do differently next time is to serve over rice or rice noodles instead of egg noodles. I also added crushed chili peppers to mine because I like a bit of heat. I am so glad this turned out so well for you Lesley! Thank you and I hope you love it with rice noodles.. YUM! I’m going to make this tomorrow because it looks amazing. I was wondering if I could sub beet green for the kale as that is what I have on hand. I guess we’ll find out. Hey Kate! Did you use the slow cooker? Was there any kind of change in the recipe? Any details would be helpful in problem solving. Sorry for the trouble! Hi there, I added 2 cans of coconut milk, seems like alot in proportion to the curry paste. Am I reading that right? Thanks! Love all your recipes! Hi Tieghan. Yes I did use the slow cooker and I did not add any water to the recipe-other than that I followed all of your directions. I wonder if maybe the broth does not need to be added and this may have made it soupy? Thanks- Merry Christmas! hi! Sounds like your slow cooker just trapped in all the moisture. Try leaving the lid off the curry for 30 minutes to and hour before serving to thicken it up! Hope this helps! I will try this – but making it VEGAN by using vegan fish sauce and not egg noodles. Then it will be GREAT, vegan and GF!!! I love that! I hope it turned out amazing for you, Sue! I loved this! Didn’t add any water, and added the line juice at the end. Can’t wait to make it again! Thank you so much Dawn! I am so glad you liked this! Made this tonight and family lived it! Another HBH hit! I am so glad you loved this curry Lorianne! Thank you! Hi Carokro! I am sorry about that! I hope this recipe was still delicious for you. Are there any questions I could answer? Yum! This recipe is delicious. And so simple. I added some broccoli last minute and even ate it without noodles. Delicious! I am so glad you loved this Aimee! Thank you so much! I just made this tonight, absolutely love it!! Hi Eddie! It is more so for taste in there.. I think it pairs really well. Do you not like the taste or have an allergy? If it is an allergy I have heard that sunflower butter tastes very similar to peanut! Made it, loved it, will make it again! Loving your vegan recipes! Made this last night for guests. The first curry I have cooked. Turned out great. Used frozen butternut squash. Served with light brown basmati rice, a lime wedge and topped with roasted pumpkin seeds and paired with a CA pinot noir. Guests raved. The housed smelled wonderful as the crockpot bubbled. I’ve enjoyed your recipes as I ve gotten reacquainted with my crockpot. I made this with sweet potatoes and collard greens instead of the butternut and kale. It was so easy and delicious! I didn’t add any additional liquid (broth or water) based on other reviews and it came out great!